US war-fighting numbers to knock your socks off. In my 1950s childhood, Ripley’s Believe It or Not was part of everyday life, a syndicated comics page feature where you could stumble upon such mind-boggling facts as: "If all the Chinese in the world were to march four abreast past a given point, they would never finish passing though they marched forever and forever." Or if you were young and iconoclastic, you could chuckle over Mad magazine’s parody, "Ripup’s Believe It or Don’t!" With our Afghan and Iraq wars on my mind, I’ve been wondering whether Ripley’s moment hasn’t returned. Here, for instance, are some figures offered in a Washington Post piece by Lieutenant General James H. Pillsbury, deputy commanding general of the US Army Materiel Command, who is deeply involved in the "drawdown of the logistics operation in Iraq": "There are…more than 341 facilities; 263,000 soldiers, Defense Department civilians and contractor employees; 83,000 containers; 42,000 vehicles; 3 million equipment items; and roughly $54 billion in assets that will ultimately be removed from Iraq." Admittedly, that list lacks the "believe it or not" tagline, but otherwise Ripley’s couldn’t have put it more staggeringly. And here’s Pillsbury’s Ripley-esque kicker: the American drawdown will be the "equivalent, in personnel terms alone, of relocating the entire population of Buffalo, New York." When it comes to that slo-mo drawdown, all the numbers turn out to be staggering. They are also a reminder of just how the Pentagon has been fighting its wars in these last years–like a compulsive shopper without a twelve-step recovery program in sight. Whether it’s 3.1 million items of equipment, or 3 million, 2.8 million, or 1.5 million, whether 341 "facilities" (not including perhaps ten mega-bases which will still be operating in 2011 with tens of thousands of American soldiers, civilians and private contractors working and living on them) or more than 350 forward operating facilities, or 290 bases are to be shut down, the numbers from Iraq are simply out of this world. Those sorts of figures define the US military in the Bush era–and now Obama’s–as the most materiel-profligate war-making machine ever. Where armies once had baggage trains and camp followers, our camp followers now help plant our military in foreign soil, build its housing and defenses and then supply it with vast quantities of food, water, fuel and God knows what else. In this way, our troops carry not just packs on their backs, but a total, transplantable society right down to the PXs, massage parlors, food courts, and miniature golf courses. 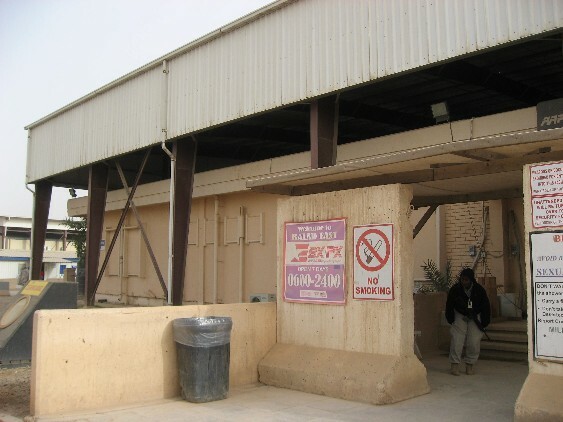 At Kandahar Air Base in Afghanistan, there was until recently a "boardwalk" that typically included a "Burger King, a Subway sandwich shop, three cafes, several general stores, a Cold Mountain Creamery, [and an] Oakley sunglasses outlet." Atypically enough, however, a TGI Friday’s, which had just joined the line-up, was recently ordered shut down along with some of the other stores by Afghan war commander General Stanley McChrystal as inimical to the war effort. In Ripley’s terms, if you were to put all the vehicles, equipment and other materiel we managed to transport to Iraq and Afghanistan "four abreast," they, too, might stretch a fair way around the planet. And wouldn’t that be an illustration worthy of the old Ripley’s cartoon–all those coffee makers and port-a-potties and Internet cafes, even that imported sand, which, if more widely known about, might change the phrase "taking coals to Newcastle" to "bringing sand to Iraq"? 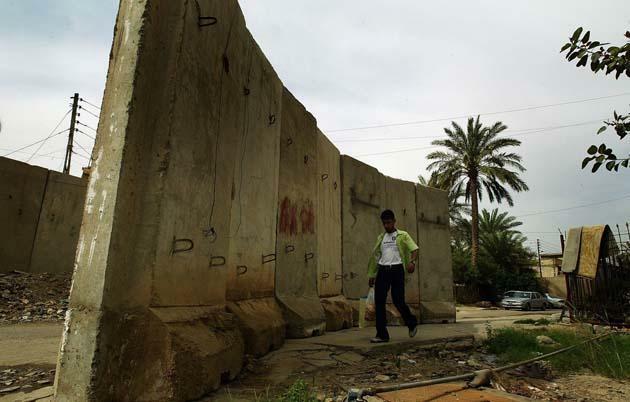 For all the sand Iraq did have, from the point of view of the US military it didn’t have the perfect type for making the miles of protective "blast walls" that became a common feature of the post-invasion landscape. So, according to Stephen Farrell of the New York Times, US taxpayer dollars floated in boatloads of foreign sand from the United Arab Emirates and Qatar to create those fifteen-ton blast walls at $3,500 a pop. US planners are now evidently wondering whether to ship some of the leftover walls thousands of miles by staggeringly roundabout routes to Afghanistan at a transportation cost of $15,000 each. When it comes to the US drawdown in Iraq and the build-up in Afghanistan, in fact, the numbers, any numbers, are little short of unbelievable. § Believe it or not, for instance, US commanders in our war zones have more than one billion Congressionally mandated dollars a year at their disposal to spend on making "friends with local citizens and help[ing] struggling economies." It’s all socked away in the Commander’s Emergency Response Program. Think of it as a local community-bribery account which, best of all, seems not to require the slightest accountability to Congress for where or how the money is spent. § Believe it or not (small change department), the Pentagon is planning to spend an initial $50 million from a "$350 million Pentagon program designed to improve the counterterrorism operations of US allies" on Croatia, Georgia, Hungary, Latvia, Lithuania, and Estonia, all of whom, in the latest version of the Coalition of the Billing, just happen to have small numbers of troops deployed in Afghanistan. The backdrop for this is Canada’s decision to withdraw its combat forces from Afghanistan in 2011 and a fear in Washington that the larger European allies may threaten to bail as well. Think of that $50 million as a down payment on a state bribery program–and the Pentagon is reportedly hoping to pry more money loose from Congress to pay off the smaller "allies" in a bigger way in the future. § Believe it or not, according to a recent report by the Pentagon inspector general, private contractor KBR, holding a $38 billion contract to provide the US military with "a range of logistic services," has cost Washington $21 million in "waste" on truck maintenance alone by billing for twelve hours of work when, on average, its employees were actually putting in one hour and twenty minutes. § Believe it or not, the State Department has paid another private contractor, Triple Canopy, $438 million since mid-2005 simply to guard the massive, 104-acre US Embassy in Baghdad, the largest on the planet. That’s more than half the price tag to build the embassy, the running of which is expected to cost an estimated $1.8 billion dollars in 2010. Triple Canopy now has 1,800 employees dedicated to embassy protection in the Iraqi capital, mainly Ugandan and Peruvian security guards. At $736 million to build, the embassy itself is a numbers wonder (and has only recently had its sizeable playing field astroturfed–"the first artificial turf sports field in Iraq"–also assumedly at taxpayer expense). Fans of Ripley-esque diplomatic gigantism should have no fears about the future either: the United States is now planning to build another "mother ship" of similar size and cost in Islamabad, Pakistan. § Believe it or not, according to Nick Turse of TomDispatch.com, nearly 400 bases for US troops, CIA operatives, special operations forces, NATO allies, and civilian contractors have already been constructed in Afghanistan, topping the base-building figures for Iraq by about 100 in a situation in which almost every bit of material has to be transported into the country. The base-building spree has yet to end. § Believe it or not, according to the Washington Post, the Defense Department has awarded a contract worth up to $360 million to the son of an Afghan cabinet minister to transport US military supplies through some of the most dangerous parts of Afghanistan–and his company has no trucks. (He hires subcontractors who evidently pay off the Taliban as part of a large-scale protection racket that allows the supplies through unharmed.) This contract is, in turn, part of a $2.1 billion Host Nation Trucking contract whose recipients may be deeply involved in extortion and smuggling rackets, and over which the Pentagon reportedly exercises little oversight. Believe it or not, the staggering logistics effort underway to transport part of the American way of war from Iraq to Afghanistan is now being compared by those involved to Hannibal (not Lecter) crossing the Alps with his cohort of battle elephants, or to that ancient conqueror of conquerors, Alexander the Great ("the largest building boom in Afghanistan since Alexander built Kandahar"). It has become commonplace as well to say, as President Obama did at Bagram Air Base on his recent six-hour Afghan drop-in, that the US military is "the finest military in the history of the world," or as his predecessor put it even more emphatically, "the greatest force for human liberation the world has ever known." The Ripley-esque numbers, however, tell a somewhat different story. If war were really a Believe It or Not matter, or victory lay in the number of hamburgers transported or the price of fuel consumed, the US military would have been the winner long ago. After all, it may be the most product-profligate military with the heaviest "footprint" in history. Though it’s seldom thought strange (and rarely commented upon in the United States), the Pentagon practices war as a form of mass consumption and so, not surprisingly, bears a striking resemblance to the society it comes from. Like the Taliban, it carries its way of life to war on its back. It’s striking, of course, that all this is happening at a moment when, domestically, small businesses can’t get loans and close to 10 percent of the population is officially out of work, while state governments are desperately scrabbling for every available dollar (and some that aren’t), even as they cut what would once have been considered basic services. In contrast, the Pentagon is fighting its distant wars as if American pockets had no bottoms, the national treasury had no limits and there was quite literally no tomorrow. And there’s one more small contrast to be made when it comes to the finest military in the history of the world: for all the private security guards, mountains of burgers, lakes of gasoline, miles of blast walls and satchels of cash to pass out to the locals, it’s been remarkably unsuccessful in its pacification campaigns against some of the most motley forces of our time. The US military has been fought to something like a draw by relatively modest-sized, relatively lightly armed minority insurgencies that don’t even pass muster when it comes to shooting straight. Vast piles of money and vast quantities of materiel have been squandered; equipment by the boatload has been used up; lives have been wasted in profusion; and yet the winners of our wars might turn out to be Iran and China. The American way of war, unfortunately, has the numbers to die for, just not to live by. [Note on Sources: Let me offer a small series of bows to six websites I find invaluable for keeping up on America’s wars. Each is a regular morning stop on my tour of the Internet: Antiwar.com, a site full of surprises, which collects the most interesting reporting of the day on America’s wars and incursions; Juan Cole’s Informed Comment which, for years now, has provided an analytic framework for, and a brilliant running commentary on, American war policy in the Middle East; the War in Context whose canny editor, Paul Woodward, recently aptly termed the American war in Afghanistan "a war of indifference"; Asia Times, a high-quality online publication that provides regular overviews on the Middle East and Asia; Noah Shachtman’s Danger Room at Wired, a must-visit for the latest in US military developments; and Katherine Tiedemann’s "Daily Brief" at the AfPak Channel, which provides a daily summary of key mainstream reporting on the Afghan war.